What exactly is a ‘recipe collection’? The most obvious answer is something like the example shown below, a formal ‘receptaria’ book of medical receipts and remedies. In the early modern period, and across Europe, these types of collections were fairly common, and especially in wealthier households. These were often carefully constructed documents, containing indices and sometimes containing groups of remedies according to various types of remedy, or parts of the body. In many ways these were the high-end of domestic medicine. For a start, paper was an expensive commodity in the early modern period. 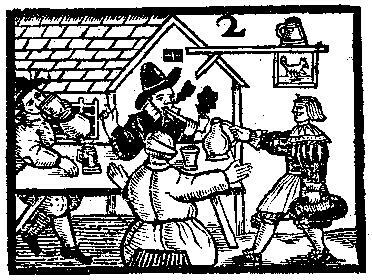 It could often be bought easily enough; apothecaries often sold reams or ells of paper, as did other retailers from merchants to haberdashers. But it was nonetheless quite costly. Unlike today, where scribble pads and notebooks can be bought for pennies, the buying of paper, or a bound book of notepaper, would have been something out of the ordinary, especially for those on low incomes. The recording of remedies was an expedient and often pragmatic process. Remedies usually spread firstly by word of mouth, with people passing on their favourite receipts to friends, neighbours and acquaintances. As Adam Fox’s work on early modern oral culture has shown (Oral and Literate Culture in England, 1500-1700 (Oxford: Clarendon, 2000)) people had a strong ability to commit information to memory, and this made sense at a time when the majority of the population couldn’t read or write. Nevertheless, for those wishing to record the remedy accurately for future use, there was a need to do so quickly, and often using whatever was to hand. As such, many ‘remedy collections’ are little more than assemblages of roughly scribbled notes, sometimes on torn bits of paper, sometimes on the back of unrelated documents, and sometimes even including a variety of other information on the same page. In fact, the very survival of many remedies is probably attributable to the fact that they have been incorporated into other, non-medical, documents. In another sense, though, putting remedies in amongst religious verses, as often occurred in commonplace books and notebooks, was a way of allying the remedy to the power of religion. If it was next to God’s word on paper, perhaps it would have more power? Above all, for the remedy to be of any use, it had to be easy to find when needed. Some, for example, kept remedies within the pages of their business ledgers. Here, the regimented layout perhaps suited ease of future reference. But perhaps most common was to keep remedies within the pages of personal sources. Many diarists noted down examples of favoured remedies, especially when they had suffered from an ailment and attributed their recovery to the taking of a particular remedy. Commonplace books, notebooks and copy books were also common places for the jotting down of useful information, and could be easily referred to if needed. It was not uncommon to put remedies within pages of miscellany, including accounts, quotes, poetry and family records, locating it firmly within the context of ‘useful’ information. Many literate families also kept letters. Health was a regular topic of conversation amongst letter writers, and it was common to fire off a few missives seeking potential remedies from within one’s social network. When a reply duly came, here was a ready-made receipt that could be kept without needing to write it down again. Prescriptions and directions from practitioners might be especially prized as they represented a virtual consultation, specially tailored to the recipient’s humoral constitution. One often-overlooked method, however, were medical almanacs. It’s worth looking at a typical example of how these sources could be used. Cardiff Public Library MS 1.475 is a small memoranda book dating to around 1708, and seemingly originating from London, with the names John and Elizabeth Price prominent. A little list of family notes inside the front cover reveal a touching and tragic tale. Married then to the pretty, the charming Mrs Elizabeth Price by the Rev’d Dr Typing of Camberwell. Much of the document, however, is actually drawn on the reverse side of copies of almanacks. These were part-astrological, part-magical and part-news documents which contained everything from prognostications and predictions to religious dates, weather information and medicine. The first almanac in this document is ‘Merlinus Liberatus, being an alamanack for the year of our Blessed Saviour’s Incarnation, 1708…by John Partridge, student in Physick and Astrology at the Blue Ball in Salisbury Street in the Strand, London”. Partridge was clearly an entrepreneur; the very next page of his almanck is dedicated to ‘Partridges Purging Pills, useful in all cases where purging is required”! This sort of document was a cheap means of buying a ready-made remedy collection, complete with the latest thinking and couched in terms of the layman. There were many self-help volumes of family physick available, but these cheaper almanac and chapbook style documents were easier to read and easier to keep. It is also clear that the spaces on the back of pages were useful places to note down other remedies as they accrued. For example, the Prices noted down a number of receipts on the back pages, including a receipt “To prevent a return of the ague”, another for the “dead palsy”, including mistletoe, oak and saffron, and another for “flushings in the face”. Here, then, the printed and the written remedy intertwined to become a completely distinct and individual family collection. In many ways this was as formal a collection as a ‘receptaria’, and probably included many of the same sorts of remedies, but in a different form. The recording of remedies, and the idea of a ‘remedy collection’, therefore, shouldn’t necessarily be limited to a single, formalised and regimented document. These were organic documents, sometimes constructed carefully, but often just growing as collections of rough notes. Remedies might be deliberately placed within documents, or they might be the result of a roughly-scribbled note. Equally, people might keep ready printed or written remedies, and simply add their own notes as required. In this sense, there is no single ‘remedy collection’ document; instead, there are a myriad different ways in which people collected remedies. Seeing History: The rise of spectacles in early modern Britain. The percentage of people in the UK requiring either spectacles or contact lenses has risen over successive decades. It is difficult to put exact figures on this; some estimates suggest that over 68% of the population in Britain currently wear glasses or lenses, and this varies dramatically within age groups. Around 29% of 16-18 year olds require some sort of visual aid; a 2005 report put the figure for the age group 65 and above as high as 98%. It seems that spectacles today have largely shed their pejorative connotations and even become desirable, helped by many high-profile celebrity spec-wearers. Indeed, opticians have even reported a growth in sales of spectacles with blank lenses over recent years, to cater for those who see glasses as a fashion item. This apparent love affair with spectacles is not consistent, however. 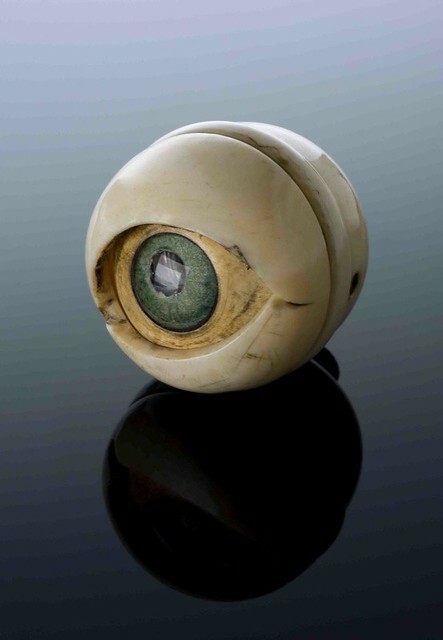 A prosthetic eye, possible 17th century. Opthalmic surgery was also in its infancy, with a procedure known as ‘couching’ or ‘cooching’ being one of the most invasive operations undertaken, being used for the treatment of cataracts. Here, a small silver instrument called an itinerarium was passed into the sufferer’s eye. The intention was to physically push the cataract film back away from the lens of the eye and thus clear the vision. This was doubtless uncomfortable and seems almost impossible to imagine – bearing in mind the patient was awake and conscious at the time. We shouldn’t assume that it was necessarily dangerous though. The seventeenth-century diarist Walter Powell of Llantilio Crossenny, in Monmouthshire, endured the procedure three times and still carried on with his diary afterwards, so presumably his vision was little worse if it wasn’t much better. The wearing of spectacles was certainly known in Tudor times. Most typically, these were armless and sat on the bridge of the wearer’s nose. There were other types of device that could be used. Fearing he was losing his sight after years of close working in extremely bad light, Samuel Pepys tried a revolutionary new device in 1668 (the “tubespecticall”) which involved reading through three-inch long paper tubes, which eliminated glare and excess light. Essentially, however, these were items connected with a physical disability – the same as prosthetic limbs, bandages or trusses. The 17th century, though, witnessed the beginning of a shift towards people being more comfortable with what was essentially a form of disability, and this was especially noticeable in portraiture. Fashion was a factor to some extent. In previous blog posts I have noted the use of steel as a desirable material, and shining steel spectacles represented a desirable fashion item. As such, steel spectacles could also be a mark of literacy and wealth. Eighteenth-century spectacle makers also needed to adapt to the times, and produce items that could fit with current fashions. One of the most important exponents of this, and indeed in many ways a forefather of the modern spectacle designs, were ‘Martin’s Margins’, invented by the London maker Benjamin Martin. These were fairly revolutionary. Rather than sitting on the wearer’s nose, they had spring-loaded arms which enabled them to adhere seamlessly to the head, with less chance of falling off and being damaged. There was also a medical aspect to the use of spectacles: too much light was seen as potentially injurious to vision, and spectacles were sometimes designed to restrict the amount of light entering the eyes. Tinted lenses, especially green, were considered to be therapeutic in the 17th century (note the green lenses in the ‘Martin’s Margins’ above too).